Sydney Brenner CH FRS (13 January 1927 – 5 April 2019) was a South African biologist and a 2002 Nobel Prize in Physiology or Medicine laureate, shared with Robert Horvitz and John Sulston. He was of Jewish descent. Brenner made significant contributions to work on the genetic code, and other areas of molecular biology. He established the roundworm Caenorhabditis elegans as a model organism for the investigation of developmental biology. He founded the Molecular Sciences Institute in Berkeley, California. Brenner made several important contributions to molecular biology in the 1960s. With Francis Crick and others, he worked out the genetic code, where triplets of nucleic acid bases are translated into amino acids. Brenner then focused on establishing Caenorhabditis elegans as a model organism for the investigation of animal development including development of the nervous system. Brenner chose this 1 millimeter-long soil roundworm mainly because it is simple, is easy to grow in bulk populations, and turned out to be convenient for genetic analysis. For this work, he shared the 2002 Nobel Prize in Physiology or Medicine with Robert Horvitz and John Sulston. His Nobel lecture in December 2002, "Nature's gift to science" is a homage to this modest nematode. He considers chosing the right organism is as important as picking the right problems to work on. In recognition of his pioneering work on C. elegans, another closely related nematode was given the scientific name Caenorhabditis brenneri. Brenner founded the Molecular Sciences Institute in Berkeley, CA in 1996. He is currently associated with the Salk Institute, the Institute of Molecular and Cell Biology, the Singapore Biomedical Research Council and the Howard Hughes Medical Institute. In August 2005 Brenner was appointed president of the Okinawa Institute of Science and Technology. He is also on the Board of Scientific Governors at the Scripps Research Institute. Known for his scientific insight and wit, Brenner for many years penned a regular column ("Loose Ends") in the journal Current Biology. Brenner was noted for his generosity of ideas and the great number of students and colleagues his ideas have stimulated. Brenner died on 5 April 2019 in Singapore. He was 92. ↑ Sydney Brenner (8 December 2002). "Nobel Lecture: Nature's gift to science" (video & pdf). nobelprize.org. Retrieved 2008-09-28. ↑ Sudhausi, Walter; Kiontke, Karin (25 April 2007). "Comparison of the cryptic nematode species Caenorhabditis brenneri sp. n" (pdf). Zootaxa (Magnolia Press) 1456: 45–62. http://www.mapress.com/zootaxa/2007f/zt01456p062.pdf. Retrieved 2008-09-28. ↑ "Sydney Brenner, 'father of the worm' and decoder of DNA, dies at 92". asianscientist.com. 5 April 2019. Retrieved 5 April 2019. 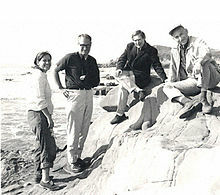 Wikimedia Commons has media related to Sydney Brenner. This page was last changed on 11 April 2019, at 02:39.